I’ve noticed a disturbing trend as of late. I’m not the only one. It’s become evident to many who appreciate the orthodox and conventional approach to historical studies. More and more have we seen the growing popularity in alternative history and alternative science. It goes by other names, my own favorite being “fringe.” You’ll also see “pyramiodiocy” applied to those strange theories smacking against the academic understanding of pharaonic Egypt. “Pseudoscience” and “pseudohistory” are also commonly used, as is “junk science.” “Cult archaeology” is yet another. Whatever you wish to call it, the phenomenon reflects a growing trend among laypeople to question orthodox science and research in favor of the implausible, the unrealistic, and the just plain bizarre. Exactly why this trend is on the rise is not always clear, but to me it seems many adults seem to lack the ability to apply critical thinking in their everyday lives. This very problem was the subject of a recent article in the Chicago Tribune (see online article here). Whether our students are being educated to learn and apply critical thinking is a subject unto itself, so I encourage you to read the article in the link. For the subject of my current blog article, I’d like to touch on the phenomenon as it concerns historical studies specifically. We are bombarded in our modern media by all manner of questionable literature and television programming, and to be sure this is part of the problem. The sharp decline in the quality of programming on the History Channel as of late is a painfully obvious example of this. That the once-solid channel should now air and promote uninformed flotsam such as Ancient Aliens is a symptom of a much larger problem. More and more I’m encountering people in my museum work who watch and actually believe this program to be accurate. It’s cute when a little kid tells me this, but rather depressing when the same is said by an adult. Fringe media are aimed at the non-expert due to overt and covert reasons, be they religious, political, or commercial (Flemming 2006: 47-49). Think of the books sold by the likes of Zecharia Sitchin, Erich von Däniken, Graham Hancock, and Robert Bauval. While I don’t decry these people’s right to earn a living in they way they might best be suited, I definitely charge them with patent dishonesty and intellectual malfeasance in trying to pass off their literature as hard-core fact. As with Ancient Aliens, such literature is an artful collection of half-truths, twisted truths, incomplete information, distorted evidence, and just plain nonsense. Few people have contributed so heartily to human stupidity. Where this all began is not so easy to pinpoint. It’s not exactly a modern problem—it has become only much more serious in modern times. Wherever and whenever man does not understand something and does not have the opportunity to educate himself—or just plain doesn’t have the desire to educate himself—he tends to replace facts with fantasy. There have always been kooks among us. It’s human nature. I can take us back to the nineteenth century, when the study of the great ancient Near Eastern civilizations was still in its early stages. Not everyone touring and exploring the ancient pharaonic monuments was doing so with sound academic mind. In 1859 a Brit named John Taylor published a book called The Great Pyramid: Why was it built and Who built it? Taylor devised all sorts of supernatural origins for the Great Pyramid and argued that its astonishing precision meant it simply could not have been built by man. Science itself was still in its early days, if you will, so Taylor was one of many in his time who regarded the Bible as literal truth. This means he held to Archbishop Usher’s conclusions that the Earth was created in 4004 BCE (Drower 1995: 27). Even in Taylor’s day many people must have fathomed the great antiquity of the Great Pyramid, so they could not reconcile it with Archbishop Usher’s dates. A friend and supporter of Taylor’s was Chalres Piazzi Smyth, who was much influenced by the former and published a book in 1874 called Our Inheritance in the Great Pyramid. Smyth wasn’t completely daft, I have to admit. An educated man, he was Astronomer Royal for Scotland. His enthusiasm for Taylor’s work and his own writing on the subject was arguably more due to his religious faith than to any scientific thought. Consider, for example that Smyth belonged to the British Israelites and believed the British were the Lost Tribes of Israel. His odd leanings toward the Great Pyramid were more or less certain to follow. Smyth believed that locked within the Great Pyramid were divine mathematical measurements reflecting the physical location of the pyramid itself and the world in general. When the measurements were drawn and correctly interpreted, Smyth argued, the divinely constructed Great Pyramid would convey God’s message. To help to affect this, Smyth even devised a means of measurement called the “pyramid inch” that he based on the Hebrew cubit so that each pyramid inch was equal to 1.001 of a British inch (ibid 28). Talk about critical thinking, or a lack thereof. I have to hope, due to the man’s sound scientific training in astronomy, that Smyth himself understood his pyramid inch was not something known in ancient Egypt. In other words, the pyramid inch is irrelevant. 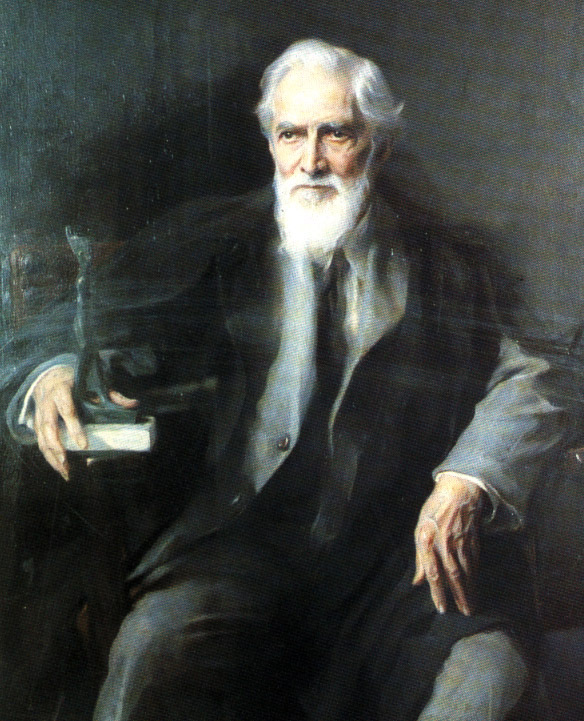 Enter William Matthew Flinders Petrie, a self-educated Brit and one of the founders of the modern field of Egyptology. What follows is what I consider to be a delicious irony. As a young man Petrie read Smyth’s Our Inheritance in the Great Pyramid and was thrilled by it. His imagination was charged. Petrie originally went to Egypt to measure the Great Pyramid for himself, to see how precise Smyth’s scheme might be reflected in real surveying. Petrie and Smyth were actually friends, so Petrie was hoping to corroborate his friend’s beliefs. 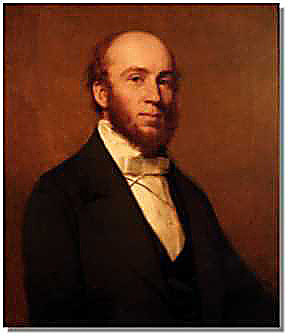 Petrie’s father, William Petrie, was a talented land surveyor and passed on his skills to his son. Petrie himself went on to improve on his father’s techniques and built his own surveying equipment. In fact, Petrie was the first man to perform an accurate land survey of Stonehenge. Petrie spent considerable time surveying the Great Pyramid. He lived on-site. Petrie’s surveys were so precise and thorough that they are still used today (see Craig B. Smith, 2004). And upon his conclusions, Petrie couldn’t help but report that Piazzi Smyth’s entire theme of divine mathematics was a load of bull-flop (my words, not Petrie’s). The science doesn’t lie. Needless to say, Petrie and Smyth were no longer friends after Petrie’s work was published. Nevertheless, many other people were inspired by the writing of folks like Taylor and Smyth, and went to Egypt for themselves to explore and poke and prod the Great Pyramid. And measure it, of course. So rose the derogatory term “Pyramid-measurer,” employed by Petrie and others of sound academic mind to refer to Taylor’s and Smyth’s misguided acolytes. And just like today, the pyramidiots of Petrie’s time were not above dishonesty to prove their schemes. One day a friend of Petrie’s, Dr. James Grant, came upon a Pyramid-measurer at the Great Pyramid who was busy filing down a granite boss. When Grant inquired to the fellow as to why he was doing this, the Pyramid-measurer relied that he wanted to refine the spot so it would work for his “Inspiration theories” (ibid 40). It would appear, then, that a lack of critical thinking was quite a problem in Petrie’s day, too. A common tactic is summarily to dismiss ancient achievements as those of regular humankind. The Great Pyramid couldn’t have been built by men living in the Early Bronze Age. The wonderful stonework of Puma Punku in Bolivia couldn’t have been achieved by primitive indigenous populations. The beautiful stoneware vessels of the ancient Near East, going back into Neolithic times, just couldn’t have been made by such primitives. You’ll see the sentiment echoed by the likes of Chris Dunn, who sees only modern-type tool marks in ancient engineering and believes the Great Pyramid was actually a gigantic machine. Dunn is popular with a lot of fringe adherents today, but the chief failing in such people is their lack of familiarity with ancient engineering and the capabilities as well as limitations of craftsmen and builders in the Bronze Age. Their conclusions are simply divorced from reality. It’s also a tactic employed in almost every episode of the History Channel’s program Ancient Aliens. Time and again you’ll see Erich von Däniken and Giorgio Tsoukalos express chronic astonishment at the feats of ancient engineering, and the common theme is, again, that ancient man simply couldn’t have made or built these things. Of course, in the case of Ancient Aliens, the conclusion is always and forever that aliens are responsible for these ancient wonders. Never mind that von Däniken has a criminal record in Europe for fraud, and has been caught falsifying “evidence” for his alien stories. The man has still sold a hell of a lot of books. The gullible among us seem to lap them up. It also strikes me as decidedly odd that all of this should be ascribed to aliens. We are to imagine an alien race so advanced that they can travel the cosmos in interstellar spacecraft, and possess levels of technology we humans can’t even fathom. 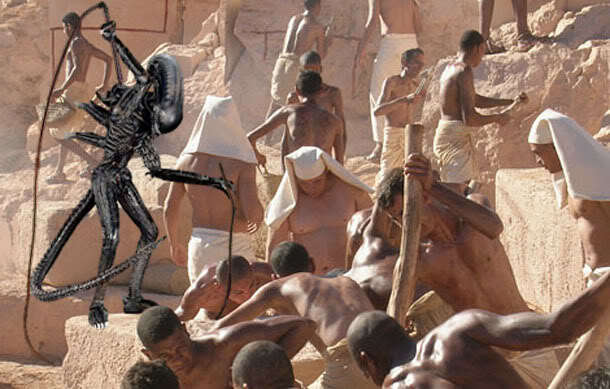 We are still supposed to believe that these aliens came all the way to our lovely little blue planet to teach ancient humans to build in…stone. Maybe these aliens accidentally left all of their tools back on their home planet. So instead of taking the time to research ancient engineering and the tools and techniques ancient man used to achieve his wonders—and trust me, the body of literature on this research is ample—we should instead exercise chronic astonishment and just chalk it up to aliens. Or lost technologies. Or lost civilizations. Atlanteans, maybe? This is the point where I might use the emoticon with rolling eyes. Here is a tactic fringe writers are more or less obligated to use. And they have done so with great abandon. I personally consider dishonesty in presenting historical accounts to be loathsome, so this one bothers me in particular. For example, for a NOVA special called The Case of the Ancient Astronauts Erich von Däniken presented photos of ancient Peruvian stones showing men employing modern technologies that could only have been taught to them by aliens. However, NOVA investigated this independently and learned that the stones were modern, and even found the potter in Peru who made them. Von Däniken had not admitted that he’d met this potter himself. Other fringe writers have turned to more subtle tactics. One of the most prolific fringe writers was Zecharia Sitchin, an author who published many books on ancient alien visitation. It is from Sitchin that the popular myth of Planet X, otherwise known as Nibiru, has proliferated on the internet—on countless half-baked websites. One could write an entire book, if not several, in pointing out the errors, omissions, and misrepresentations in Sitchin’s many books. A legitimate scholar of the ancient Near East named Michael Heiser has his own website with that in mind (source). The mythical planet Nibiru is a good example. Sitchin wrote in The 12th Planet that Nibiru is a planet beyond Pluto that once collided with a planet between Mars and Jupiter called Tiamat. The resulting destruction of Tiamat led to the creation of Earth, as well as other celestial bodies in our solar system. Sitchin believed Nibiru, which is still in orbit, is the home world of an advanced race of aliens known as the Anunnaki. This is of course an obvious and clumsy bastardization of ancient Mesopotamian myths and names, and goodness only knows how in the hell Sitchin even came up with it. Whether Sitchin himself actually believed in this stuff can be argued, but it sold his books. As “proof” for the planet Nibiru Sitchin turned to a Mesopotamian cylinder seal known as VA243, which resides in the Vorderasiatische Museum in Berlin. Note the area in the image circled in red. Sitchin argued it was a depiction of the sun circled by planets, and indicated an additional planet unknown to modern astronomy. 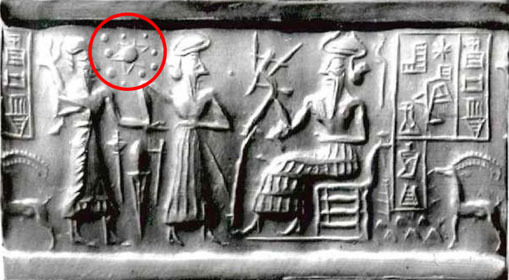 Sitchin wrote that the ancient Sumerians received advanced knowledge of science and astronomy from the visiting aliens known as the Anunnaki. This is not correct. The cylinder seal imparts no such information. The writing on it in cuneiform merely mentions a couple of names of minor officials. The circled portion in the “sky” of the seal does not show sun and planets, but stars. In Sumerian iconography, such depictions represented either stars or deities, not planets. It’s possible the small dots and larger star represen the Pleaides, which is represented as such on other cylinder seals from this region (see Heiser’s article, in PDF). In his book The Stairway to Heaven Sitchin spent a considerable amount of time misrepresenting the colossal masonry pyramids of Egypt’s Dynasty 3 and Dynasty 4. For example, he notes that these pyramids do not have hieroglyphs inscribed outside or inside them, which leads him to believe that these pyramids were either built long before hieroglyphs existed and thus long before conventional research dates them, or were not built by the Egyptians at all (1980: 339). The implication is, once again, aliens built the pyramids. This flies in the face of science and legitimate historical research. We know the Great Pyramid, for example, was built no more than about a century earlier than the conventional date of 2500 BCE (see Bonani et al 2001). And we know that no pyramid bore hieroglyphic inscriptions prior to the end of Dynasty 5, about 150 years after the erection of the Great Pyramid. There is ample research in the professional literature to explain the reasons behind this, but Sitchin’s twisting of facts is not an explanation on which one should rely. This represents a tactic of desperation on the part of fringe authors. Very few fringe writers ever attempt to deal with professional research head on, for the simple reason that they know professional historical research disproves their claims in a swift stroke. Rather, it is easier just to ignore and dismiss professional research without cause. I’ve encountered numerous fringe adherents who claim modern historical research can’t be trusted simply because it’s not really modern at all. They claim modern historians use the same tools, the same approaches, and the same attitudes as historians did in the nineteenth century. All such a comment reveals is that the person making it does not have any working understanding of modern historical research. Egyptology is a good example. I know an Egyptoloist at the Oriental Institute, University of Chicago, who likes to joke that everything she learned back in her days as a graduate student is now wrong. The field of research of pharaonic Egypt has made leaps and bounds in all facets of study in just the last several decades. At the present time Egyptology makes use of a wide range of modern specialists including surveyors, architects, cartographers, photographers, conservators, forensic anthropologists, X-ray technicians, archaeobotonists, archaeozoologists, palynologists, geologists, mineralogists, hydrologists, artists, art historians, ceramic specialists, soil experts, stratigraphy experts, hot-air balloon pilots, aerial photographers, satellite imaging technicians, electrical, mining, and structural engineers, chemists, computer programmers, draftsmen, graphic designers, cultural resource managers, statisticians, philologists, epigraphers, geophysicists, and stone technology experts (Weeks 2008: 15). As scientific fields expand and refine their methods and tools, Egyptologists turn to them for expert analysis. Paleopathologists have become an important part of studying ancient human remains, and genetics have now entered the sphere of research, too. Fringe writers will often resort to acerbic tactics to bolster their own claims while simultaneously whittling away at the world of orthodox study. These writers will paint unflattering pictures of professional historians and present them as close-minded, stale, dusty old professors. While this might aptly describe some historians, it is hardly a fair or accurate assessment. And it really doesn’t work for fringe writers. Whether they realize it or not, the more time fringe adherents spend on ridiculing professional historians, the more they themselves damage their own credibility. Personally I find this tactic to be childish. This is perhaps the most absurd and comical tactic employed by fringe writers. It definitely lacks observable critical thinking on the face of it. In this ploy fringe writers try to present the world of orthodox research as one great, shady, nefarious cabal bent on hiding “the truth” from all of us and maintaining the status quo. So there must be evidence out there for ancient alien intervention—or Atlantis or Nibiru or lost advanced technologies, what have you—but orthodox academia is working in concert to keep the information contained. So in this tactic it is known, for example, that the Great Pyramid was built by aliens or the building of it was overseen by aliens, et cetera. Egyptologists know this, but if they admit it they’ll have to rewrite all of their books and papers and all of our knowledge will have to be refashioned. Heaven forbid! This implies, then, that over the course of the past two centuries, all Egyptologists working for all institutions and universities from all over the world, have been in league with governments to keep the secret. A moment’s thought reveals the grand absurdity of this notion. Governments have never been terribly good at keeping secrets—academia, less so. This might make for an entertaining sci-fi movie, and I like movies as much as the next guy, but I do not see how any thinking, reasoning, educated adult could believe this for even a moment. So why is the appeal for the fringe so strong? Why does it continue to grow? Is it a reflection of human nature where we favor the underdog over the big and sinister opponent, in this case academia (Flemming 2006: 56)? Are people uncomfortable with science and professional research because it seems so daunting and inaccessible? I personally believe this has much to do with it, but I think the intimidation many might feel is quite exaggerated. More so than ever, the information is out there and accessible to anyone who wants to learn it. Advanced college degrees are not necessarily needed, especially if one is just an enthusiast and wants to learn. People have all manner of literature and media to educate themselves. Archaeological expeditions like Çatalhöyük, Göbekli Tepe, and the Giza Plateau Mapping Project have their own websites to keep professionals and laypeople alike informed on the work conducted there. More and more archaeologists post blogs to deliver their own work to an immediate audience. Going forward, the internet will become an even more common medium for all manner of scientific and historical information. The trick is to discern fact from fiction. For every credible and worthwhile website put up by an institute or university, I’d wager there are at least ten others of little to no scientific or historical merit. Let’s face it: any nut case with a computer and an internet connection can slap together a website to showcase his ideas, regardless of how bizarre and divorced from reality they are. One needs to recognize which is which in some cases. Sometimes websites smack of legitimate merit and reel you in, even if uniformed or misinformed material is there (something at which numerous religious zealots excel, in their bias on religious history). I worry about sincere and curious young people who want to learn about ancient history and inadvertently stumble first into the tar-pit literature of Erich von Däniken or Zecharia Sitchin. Make no mistake: these guys are good writers. It’s just that the material they impart is more fitting to Hollywood than to academia. I am always heartened, then, when I visit a book store and see this kind of stuff not in the history section but somewhere else, like occult or New Age. I feel all book stores should follow this procedure. In the end it boils down to an individual’s ability to know what is worthwhile and what is bull-flop. And this boils down to critical thinking, an ability many adults nowadays seem to lack. And so I worry. Bonani, Georges et al. “Radiocarbon Dates of Old and Middle Kingdom Monuments in Egypt.” 2001. Drower, Margaret S. Flinders Petrie: A Life in Archaeology. 1995. Flemming, N.C. “The attraction of non-rational archaeological hypotheses.” Archaeological Fantasies. Garrett G. Fagan, ed. 2006. 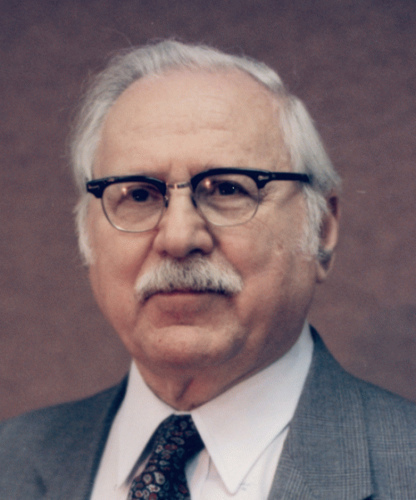 Heiser, Michael S. Sitchin Is Wrong. Sitchin, Zecharia. The Stairway to Heaven. 1980. Smith, Craig B. How the Great Pyramid Was Built. 2004. Weeks, Kent. “Archaeology and Egyptology.” Egyptology Today. Richard H. Wilkinson, ed. 2008. Did the Hebrews build the pyramids? Myth of the Egyptian "Anu People"
The death of Tutankhamun: accident, disease, or murder?